IRELAND HAS SAID it will be reviewing its place in the UN peacekeeping mission in the Golan Heights following the capture of 43 troops today. Speaking on RTÉ’s Drivetime, Defence Minister Simon Coveney said that once the immediate issue is resolved, a review of the overall mission will be undertaken. Both the Minister and the Defence Forces have confirmed that there are no Irish troops among the 43 UN Disengagement Observer Force (UNDOF) peacekeepers captured by an armed gang. Coveney said he is receiving “clear and detailed information” about the well-being and whereabouts of the members of the Irish Defence Forces in the area. He noted that the communication systems and processes are working “very well”. 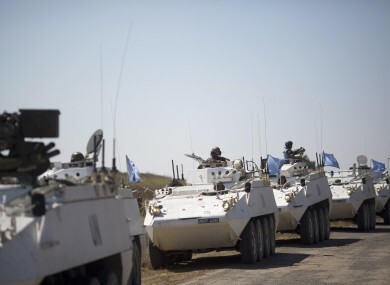 A UN statement this afternoon confirmed earlier reports that the peacekeepers had been “detained” in the Al Qunaytirah area of the Golan Heights. A spokesperson from the Defence Forces told TheJournal.ie that none of the peackeepers captured today in the Golan Heights are Irish. Citing security concerns, the Defence Forces spokesperson would not comment on the current status or location of Irish peacekeepers, other than to confirm none had been captured. Peacekeepers from UNDOF were captured in the area on two separate occasions in March and May of last year, but were later released safely. UNDOF was set up to monitor the 1974 disengagement accord between Syria and Israel after their 1973 war. It currently includes 1,223 peacekeepers from six countries: Ireland, Fiji, India, Nepal and the Netherlands. The Irish contingent of peacekeepers had been placed on “high alert” this morning, after heavy fighting between Al Qaeda-linked Islamist militants and the forces of Syrian dictator Bashar al-Assad’s government. Coveney said today that “this is not the first time the mission in the Golan Heights has had to deal with very volatile situations”. He added that the Irish troops have dealt with the situations in “a really professional way”. Email “No Irish troops among dozens of peacekeepers captured in the Golan Heights”. Feedback on “No Irish troops among dozens of peacekeepers captured in the Golan Heights”.